Here’s an unanticipated finding: TAS’ Jonathan Valin, assigned the impossible task of covering all loudspeakers at the vast High End Munich show last year, observed that most were priced above $20,000 per pair. At AXPONA 2018, with the charge of finding new products under $20k, I found that all but two in that class were under $10,000. In his show report, JV concluded that “Munich High End is the black-tie event of the season for manufacturers worldwide, and no one wants to show up in less than his finest.” While there were plenty of six-figure loudspeakers for the multitudes to salivate over at AXPONA, it seemed to me that a goal of the Chicago show was to be more inclusive, to showcase products at real-world prices that could attract a new cohort of younger music lovers to our hobby. This crop of newly introduced loudspeakers demonstrates that inexpensive gear need not deviate tremendously from the standards set by the higher-priced spread. So, with photographer Dennis Weeks in tow, here’s what I heard. Without a doubt, the product creating the greatest buzz at AXPONA 2018 was Magico’s three-way, four-driver A3 that will be selling at the very un-Magico-like price of $9800. The aluminum enclosure is built in the fashion of Magico’s pricier Q series speakers, with an elaborate system of internal supports; the drivers include a beryllium tweeter based on the one in the M series speakers (without the diamond coating) and the newly designed midrange and woofer cones have graphene diaphragms. Alon Wolf explained that considerable savings were realized by building the A3s in much larger batches than other Magico models and by offering just one finish/color option. These cost-saving measures notwithstanding, sonically, the A3 was immediately identifiable as a Magico when driven by either a Hegel or D’Agostino stereo amplifier, with characteristic clarity and seamlessness from top to bottom. I’ll want to see how the A3s stack up against S1 Mk2s, which I own and cost $6000 more. Stay tuned. 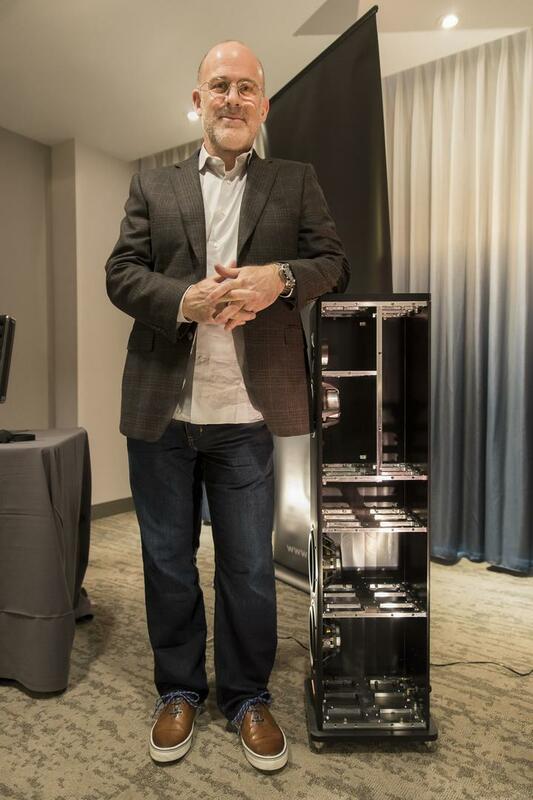 Carl Marchisotto demonstrated the Nola Contender S3 ($6900), a tall (44") but narrow (8") floorstander. In addition to a new silk dome tweeter, the Contender S3 sports two 6 ½" woofers, each situated in a separate chamber with its own double flared port, the goal being to eliminate any interaction between the two drivers. The upper woofer is ported to the rear and the lower one to the floor; the two sub-enclosures are tuned to different frequencies, which is said to smooth in-room bass response. Marchisotto feels that his design gives the speaker the coherency of a two-way with the bass extension of a three-way. Frequency response is given as 30 to 28,000Hz. Marchisotta played the Reference Recordings version of Rachmaninoff’s Symphonic Dances and the sound was impressively well balanced from top to bottom, without any sense of strain. Loudspeaker kits that enable hands-on audiophiles to assemble their own speakers have been around for a long time but rarely have they been offered with the kind of transparency as those from Creative Sound Solutions of Ypsilanti, Michigan. For the company’s P215 stand-mount monitors, CSS has published online every detail necessary to build the speakers, in addition to pertinent measurements. An interested customer has three purchase options: fully finished for $2539 ($1700 for the three weeks following the AXPONA show), with the MDF cabinet broken down plus the requisite drivers and all the necessary electronic components for $539 and, finally, one can fabricate the box himself and purchase the drivers and other parts for $439. The P215 really sounds like a $2500 speaker, and the possibility of building one for a fraction of that cost should be appealing to many fledgling audiophiles. The Neat Acoustics Iota XPLORER ($4995) is not going to win any beauty contests—it resembles the dehumidifier you keep in your wet basement—but, boy, do these English loudspeakers make a great sonic impression. Standing 29" tall, the enclosure is divided horizontally into three internal compartments. The top section, which angles upward, has a bass/midrange cone driver and an air motion transformer (AMT) tweeter mounted to the front baffle. The middle chamber, ported to the rear, accommodates the crossover and a 170mm bass driver that fires downward into the third sealed isobaric chamber to activate a second 170mm woofer ported to the floor. This unassuming speaker exhibited outstanding dynamics, an open, extended treble, and potent bass. This is clever engineering, representing an efficient use of both space and financial resources that will be appreciated by many audiophiles. After departing the Wharfedale room, Dennis (the photographer) asked me for the price of the speakers we’d just been listening to. I told him, and he didn’t believe me, so we had to retrace our steps back to Room 334 to confirm the cost of $998 per pair. There have been Wharfedale Diamonds in production since 1981 and the latest iteration, the 11 Series, utilizes larger magnets and more robust baskets. The Diamond 11.3 is a two-and-a-half-way floorstanding loudspeaker with 5" woven Kevlar bass and midrange drivers and a 1" textile dome tweeter. Bass response reported down to 44Hz (+/– 3 dB) seemed entirely believable as I listened to my Shostakovich disc, as well as a selection from Britten’s War Requiem that the exhibitor bravely volunteered. Brave because there are some challenging dynamics in the Britten piece and brave because, nowadays, nothing clears a room at an audio show like a little classical music. These substantial Canadian beauties made their debut in Munich last spring and they made their first North American appearance at AXPONA 2018. In WATT/Puppy style, the Verity Audio Othello ($18,695) is a dual-chassis design, with one enclosure for the neo-ring dome tweeter and the Audio Technology midrange driver sitting atop a larger bottom cabinet with a pair of 7" edge-coated reed/paper-pulp woofers mounted on the rear aspect of the speaker. The specimens at the show were gorgeous, sporting a high-gloss Makara finish. Driven by a Trilogy Audio Systems 925 hybrid integrated amplifier ($15,995), the Othellos delivered some of the most satisfying listening at the show, both with the Shostakovich symphony I’d brought along and one of the exhibitor’s choices, a recording of Abdullah Ibrahim playing solo at the Montreux Jazz Festival that represented the scale of his piano exactly right. Trevor Ryan was running the demos of the Ryan Speakers S610 bookshelf model ($3995). I didn’t get to ask if his brother Todd was just downstairs getting a cup of coffee or in Guangdong province supervising the manufacture of loudspeaker drivers. Ryan’s exquisite cabinets continue to be fabricated in Riverside, California; the speaker’s uniquely shaped enclosure is made from a “silent core” material with internal constrained damping. The beryllium tweeter is the same one employed in Ryan’s top-of-the-line Tempus, and it’s crossed over at to a 6.5" Nomex cone at 2000Hz. Female vocals were notably uncolored and acoustic bass was reproduced evenly. The S610s will be available over the summer. Vehement Audio presented the new Brezzo EOS, a two-way monitor priced at $2495. The speaker utilizes a RAAL 64-10 ribbon tweeter and a custom 6" SEAS reed cone woofer. Instead of the transmission line design seen with other Vehement models, the enclosure is a traditional 14" x 9" x 13" box, ported to the rear. Using technology borrowed from Vapor Audio, “inversion layer” material is applied to the inner surface of the cabinets to maximally control resonances. With Exogal electronics, these diminutive speakers players played very “big,” with excellent detail and good dynamics. Sonner Audio is a fairly new loudspeaker manufacturer based outside of Boston. The Legato Duo ($8500) is a two-and-a-half-way floorstander with a 1" ring radiator tweeter, a 5.5" coated paper cone mid/woofer, and a 6" aluminum woofer, with crossover frequencies set at 200Hz and 2.5kHz. Company president Gunny Surya was getting excellent sound with an Abbingdon Music Research DP-777 Special Edition DAC and a Luxman L-509X integrated amplifier upstream from the speakers. Satisfying orchestral weight and timbral nuance was evident even on a brief audition. 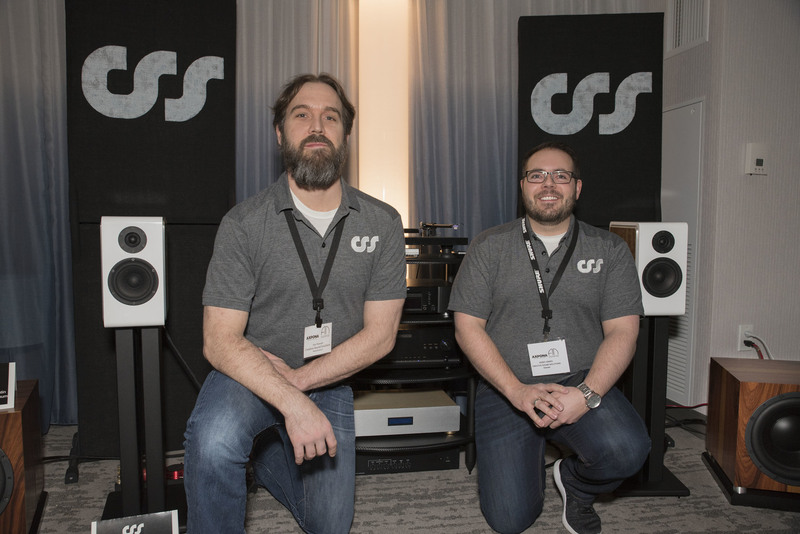 Acoustique Quality is a Czech brand I’d not encountered before and its U.S. distributor, Well Rounded Sound of Sonoma, California, brought to AXPONA the flagship of its 28 speaker lineup, the $18,000 Passion. This beautifully finished 120-pounder employs three ScanSpeak drivers and the frequency output is said to be within 4dB all the way down to 20Hz. Dynamics were commanding with large-scale program material, yet acoustic jazz came across as intimate. The Acoustic Energy AE1 is a well-regarded two-way stand-mount; 50 watts of Class A/B power is provided to each driver to make it the AE1 Active ($1800-2000, depending on finish). Fritz Speakers has been in business for 35 years and a new model, the REV 7 SE ($2800) was holding forth with Wyred 4 Sound electronics. The two-way system uses two ScanSpeak drivers, a 1" ring radiator, and a 7" Revelation mid/bass transducer, electronically united via a series crossover with no capacitors or resistors in the tweeter circuit and just one small inductor on the mid/bass side. The sound was notably uncolored and dynamic. 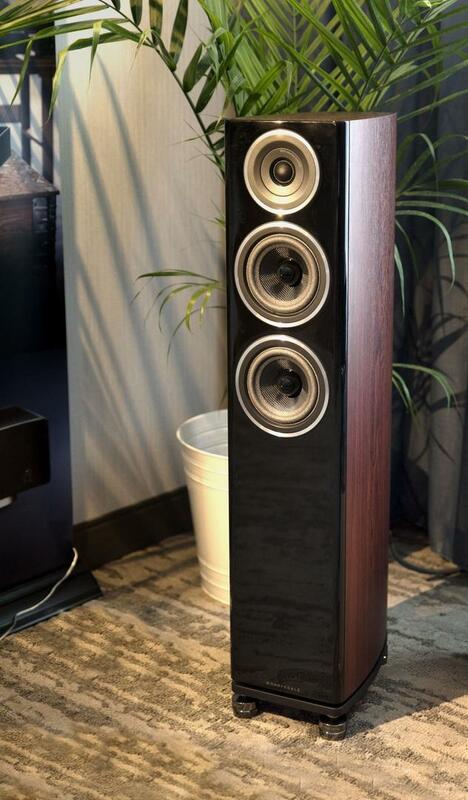 LSA Speakers introduced several new designs including the LSA-10 Statement ($3495), a bookshelf model with a copper beryllium-dome tweeter and a custom-made 6.5" black anodized-aluminum woofer. The LSA-20 Signature (also $3495) is a three-way floorstander with a silk-dome tweet, a carbon-fiber 4" mid, and a 6.5" anodized woof. It has a satin finish, as opposed to the Statement’s high gloss. Both could be played without tsuris at high levels on their own but gained significantly in power and coherency when a subwoofer—the new Emerald OB-SW24 open-baffle folded-box design—was added. 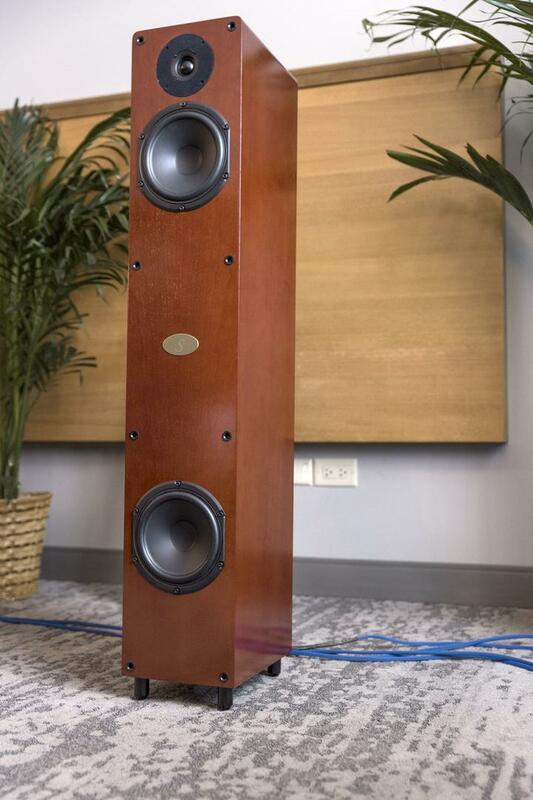 Sonist Audio of Riggins, Idaho, makes its enclosures from solid wood—poplar and mahogany are the two standard species—and with the Concerto 4 Gen 2, the “Gen 2” designation refers to a new internal layout of the speaker, upgraded crossover components, and a new wiring recipe. The sensitivity is given as an eyebrow-raising 97dB and bass is reportedly solid to below 30Hz. Studio Electric LLC, of Salt Lake City, was playing music through its m4 monitors ($2400-3100) equipped with a 1" soft-dome tweeter and a proprietary 6.5" copolymer woofer. The asymmetric crossover incorporates a number of custom components. These small loudspeakers were not embarrassed by dynamic, large-scale program material. The Italian loudspeaker designer Marco Serbi built the prototype for the two-way stand-mount introduced at AXPONA in a shoebox and decided to stick with the look, and the name. The Shoebox, which is sold along with a subwoofer called (naturally enough) the Boot, will go for around $5000. Driven by Angstrom Audio Lab electronics—Stella tube integrated mono amps ($24,600), the sound was enjoyable—detailed but not analytical. It’s not exactly a surprise when Elac shows up with something new priced under $20k—the only question is, how much under $20k? 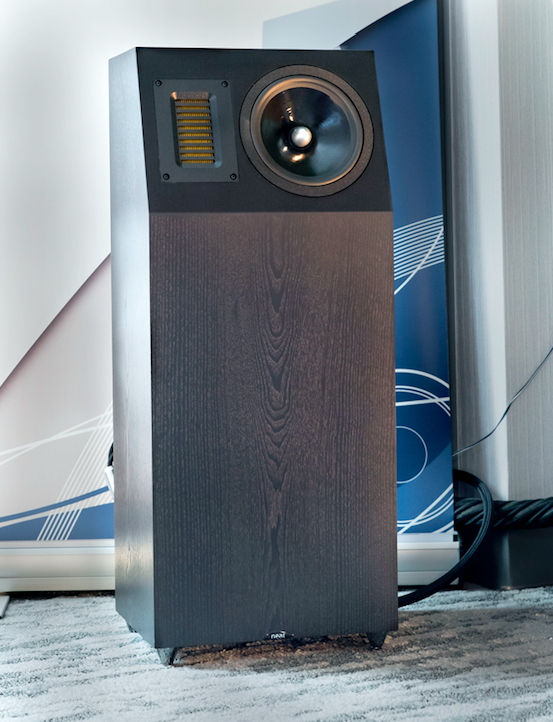 Andrew Jones was debuting his “2.0 Series” loudspeakers, which include the B6.2, a ported two-way model priced at a mere $300/pair. They’ll be sold at the Magnolia AV showrooms found in many Best Buy stores, as will the $700 Elac EA101EQ-G Series integrated amplifier, a device with Wi-Fi, Ethernet, Bluetooth, and old-fashioned analog connectivity. DSP room correction is included as well—the user operates this with an app installed on his or her cell phone. So, for about a kilobuck, regular citizens will be introduced to more than a taste of the audiophile ethos. I finally got around to getting a good listen to the GoldenEar Triton Reference loudspeaker ($8500). What AHC concluded in the pages of TAS and many folks on the Internet echo, it’s really hard to do better without spending substantially more. A true giant-killer. Gayle Sanders’ Eikon, a system from one of the industry’s great innovators that gives you a world-class loudspeaker with its own on-board amplification, DAC, and ultra-sophisticated DSP room correction. At $24,500, it’s a screaming bargain. As noted in my intro, AXPONA 2018 presented a wide choice of accomplished loudspeakers at real-world prices that could end up increasing our ranks among younger enthusiasts. 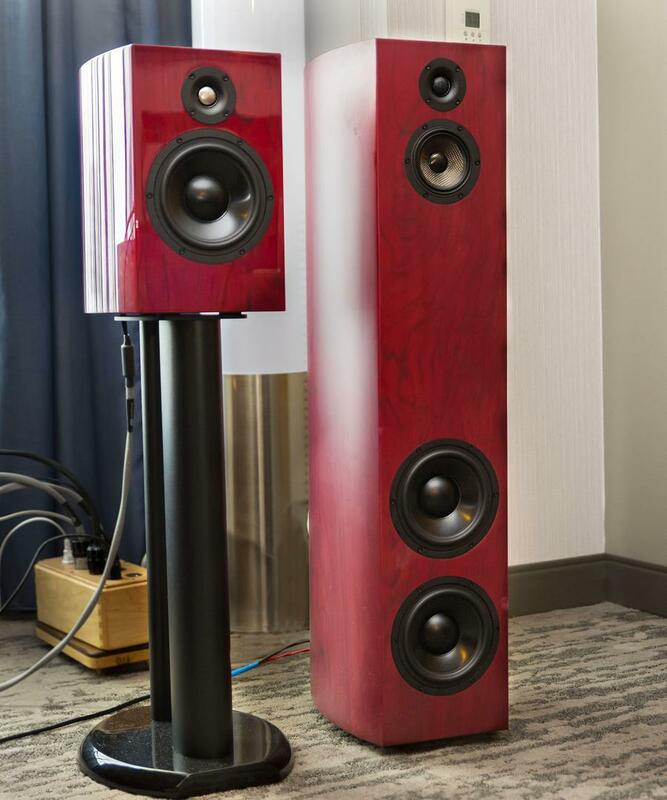 The Scaena loudspeakers. It’s not the cost that makes me realize they’ll never be mine. It’s the sheer audacity of the design and the total commitment to sound it takes to share your life with the things. That’s not me, and sometimes, I wish it were.